Everyone seems to be having such huge book hauls this week! I've heard a lot about Tangled, though this cover is different and it threw me off for a second. I read the first Passionaries book and it was so crazy that I'm not sure I'll go for the second, but there is a good chance morbid curiosity will win. :P I hope you enjoy your new books! I can recommend "Dash & Lily's" as a great book to read after reading it in late 2012. I haven't heard of "Wild", "Molly Pierce" or "Lily Graves" until this week's batch of hauls, but I've added all three to my wish list after checking out your post. Wow, such a great haul this week. Great picks on netgalley and edelweiss. oh many books! I need to read the second book in the VA series... so behind. Happy reading! The Bloodlines series are sooo good!! Ohh I like the Edelweiss collection, happy reading. To All The Boys I've Loved Before is definitely on my tbr. Can't wait to read it. I should probably get myself a paperback of Born Wicked as well. Adored this book and can't wait to own a physical copy:) Hope you enjoy all of your books! Yes, that is the reason why I got my physical copy of Born Wicked. I need the third book!! What an ending! Thanks for stopping by. Your blog is super cute, new follower! A brilliant book week, I hope you enjoy all your new reads. Oooh you've got some great books this week :-) I hope you enjoy them all! Happy Reading! Great haul! You've got a lot of amazing looking books this week. 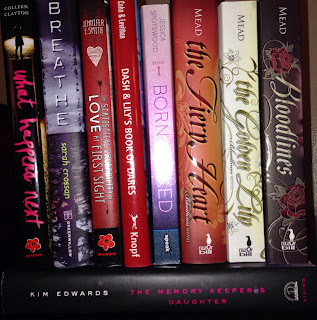 I went a little crazy on EW this week and downloaded a lot of ARCs that I could probably do without. 17 First Kisses looks like such a cute read. I hope you enjoy all of your books :) My STS. Thanks for stopping by my STS! I really liked Breathe, but had a hard time getting into the sequel for some reason. Happy reading! Nice. The Art of Lainey is really popular this week. You got some amazingly good books. Come check out my stack as well. I love Statistical Probability. I also got 17 Kisses this week, and I can't wait to get my hands on To All the Boys. Great haul! Wow! Great haul! Ah! I love the Bloodlines series, I just finished The Indigo Spell last week, it's one of my favorite series! Dash & Lily's Book of Dares is such a cute, fast read, same for The Statistical Probablity of Love at First Sight! I hope you enjoy all your books. Thanks for stopping by and happy reading! Great haul! I really want to read To All the Boys I've Loved Before and Breathe. Enjoy your new books! You got some great books there! Bloodlines is one of my favorite series; I've had The Fiery Heart since its release and have been dying to read it but just haven't had time yet. I hope you enjoy reading all of these, and thanks for stopping by! 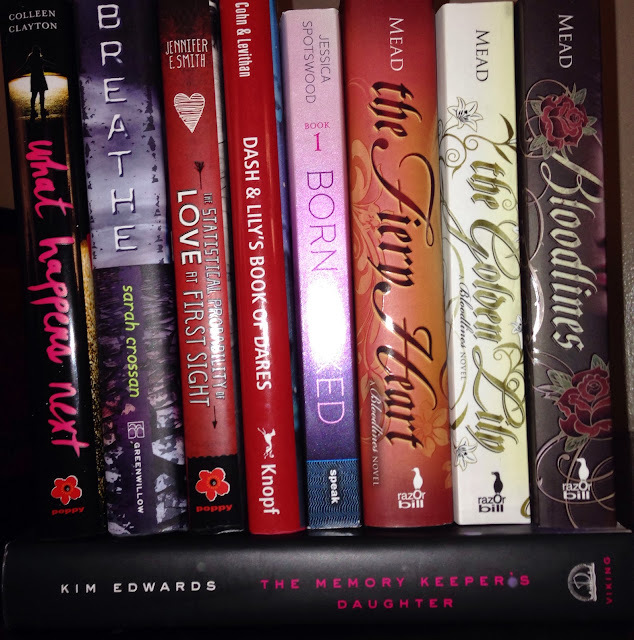 Bloodlines has been on my TBR list for a while. I hope you enjoy all of your new books!! The Statistical Probability is a great book. I hope you enjoy your books! Ohh, the Bloodlines series! I still have to read the entire VA series, but I've heard plenty of great things about the Bloodlines series.